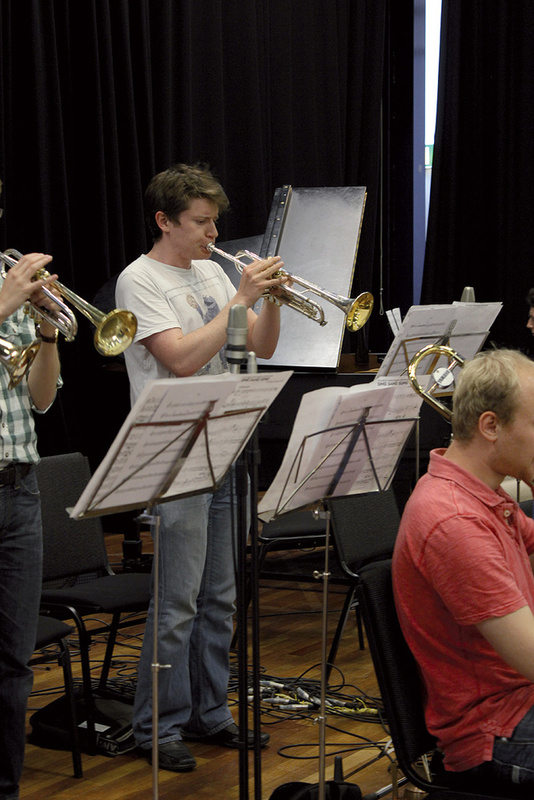 Last month, we recounted our experiences of tracking a jazz big band on location. Now we explain what it takes to turn the raw multitracks into a nicely polished production. 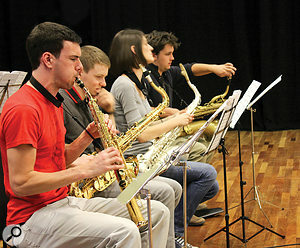 In last month's 'Session Notes', Hugh Robjohns and Matt Houghton helped SOS reader Myles Eastwood to capture Cambridge University's Selwyn Jazz big band on location, providing many useful practical insights into large-scale ensemble recording. If you missed that, you can read that article on the SOS web site at /sos/dec12/articles/session-notes-1212.htm. This month, I'm going to pick up where Hugh and Matt left off, and demonstrate how such a recording might be approached at the mixdown stage. Unlike many of the mix projects I receive, Hugh had carefully edited and consolidated his multitracks as a set of sensibly named 24-bit WAV files, and he'd also supplied a range of notes about the tracking process, including details of mic choices and placements. This made arranging the tracks within my Cockos Reaper-based mix system a no-brainer, so I was off to a flying start within about 10 minutes of breaking the DVD-ROM out of its jiffy bag. 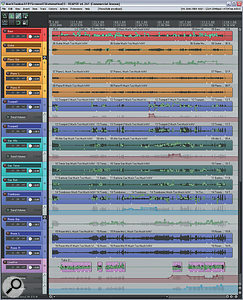 Hugh's careful consolidation and naming of the multitrack left nothing to chance, which meant Mike's DAW mix project was up and running in minutes. Faced with any acoustic multitrack, I almost always make a bee-line for the room mics. Because these usually deliver the most natural tone for each of the instruments (albeit typically with lots of room ambience), relying heavily on these mics often helps make the ensemble more believable. Consequently, I immediately knew the odds were in my favour when, upon opening up these channels, I was greeted with a nicely balanced brass timbre. There was a certain amount of reverberant bass/kick spill, as is to be expected on loud live sessions, but this was easy enough to tackle with high-pass filters. I investigated the trumpet and trombone mics next, because the saxophones were slightly favoured by the frontal room-mic positioning, and I figured these channels might help redress this. All three were commendably free of sax spill, so all was well on that front, although a side-effect of the necessarily close, on-axis mic positioning was a tonal brightness that required some shelving cut above about 3kHz to mellow. The remaining brass mics seemed promising enough, though, so I quickly filtered out unwanted LF spill from each mic in turn and panned everything relative to the room mics. For the saxes, I went with similar imaging, but I chose to widen the trumpets and trombones to match them a little more closely to the saxes. Polarity checks proved little more than a formality on this session, and the only brass mic that seemed marginally nicer-sounding inverted was the high trumpet mic, quite possibly on account of the phase shift introduced by my shelving EQ. The necessarily close mic placements on the trumpets and trombones led to an over-bright tone, but this was quickly remedied with a fairly simple EQ. Notice also the high-pass filtering used on both these instruments (and, indeed, on all the other instrument channels) to reduce the levels of bass spill in the mix as a whole. Time to grab some faders! My initial aim was to use the spot mics to inject detail and presence into the basic room-mic ensemble sound, although I was also aware of the need to return the trumpets and trombones to a more equal footing with the saxes. Pretty early on, I decided that I would employ a little bit of smoke and mirrors by delaying the room mics by about 10ms, to slightly increase the apparent size of the recording room. In addition, I refined my rough-and-ready preliminary EQ choices as the more extended listening process began to sensitise my ears to which fader settings felt most secure. For example, I noticed that bringing either the alto or tenor sax mics to an apparently satisfactory level (in terms of overall audibility) seemed to overpower the mix's lower mid-range, whereas a similarly appropriate subjective level for the high trumpet and trombone mics left this frequency zone rather anaemic. In response, I therefore made 3dB cuts at 415Hz and 335Hz respectively for each of the saxes, boosted by 3.5dB below 775Hz on the high trumpets, and added a broad 1.5dB peak at 375Hz on the trombones. 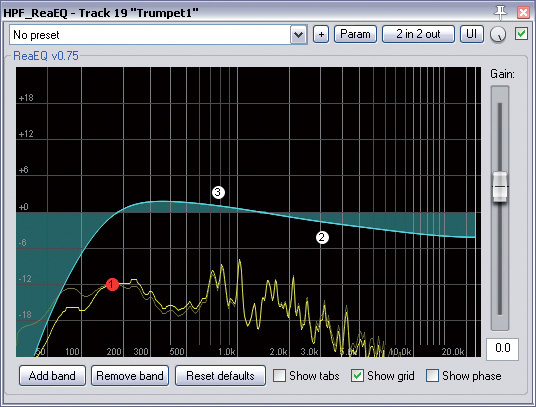 Although I wasn't keen to compress the life out of this mix, I did apply 3-5dB of medium-release levelling to the trombones to help them hold their place in the group, as well as a gentle 1.4:1 compression from Focusrite's Scarlett Compressor over the main brass bus, to restrain the dynamics of the stronger stabs, which otherwise jumped out a bit too much. Turning my attention to the piano and guitar mics, I once again filtered the bass spill and checked polarity — inverting the left channel of the piano's spaced stereo rig seemed to give a slightly more solid mono component, although there wasn't much in it. Toying with possible fader levels, I ended up reducing the low midrange on each part so that pushing them up in the mix would provide more definition without muddying the group's combined tone. In the case of the guitar part, some additional correction was required for the directional close mic's unavoidable proximity-effect bass boost. A little compression was also beneficial on the piano, because the player's performance dynamics were causing some nice details to be lost unless I put the track at a level where some chords muscled in on the foreground distractingly. However, it only required 2-3dB of gain reduction from an instance of Variety Of Sound's ThrillSeekerLA to improve matters considerably. High-pass filtering across the board had relegated the bass spill to a suitably background role, which meant that I could now create a more focused bass sound from the amp's close mic. 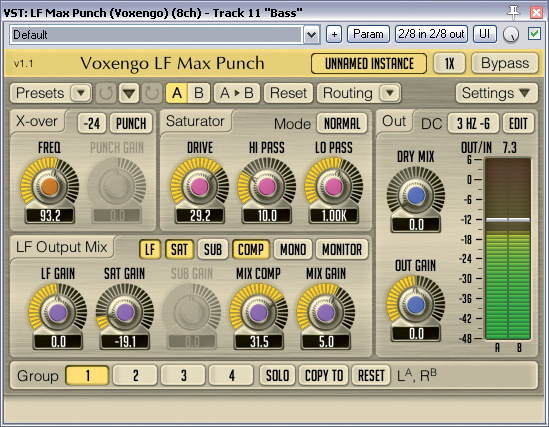 In raw form, this already presented the kind of mid-range density that's so useful for retaining audibility in a busy mix, but the small amp wasn't delivering a tremendous amount of real low-end, so I fired up Voxengo's split-band LF Max Punch plug-in to help out. First I solo'ed the low-frequency band so that I could isolate the spectral bracket I was interested in, and then applied the plug-in's LF compression routine to strengthen it to taste. While I was at it, I added a pinch of saturation to increase the warmth of the lower mid-range, before checking the weightier timbre's polarity against the mix: it seemed to give the best combination inverted. 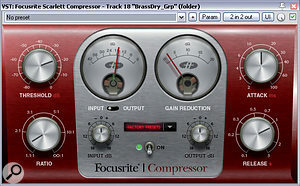 Only two compressors were used on the brass: a 5:1 setting from Reaper's ReaComp to control the trombone levels in the section balance, and an instance of Focusrite's Scarlett compressor across the section group channel to gently rein in the louder brass peaks. 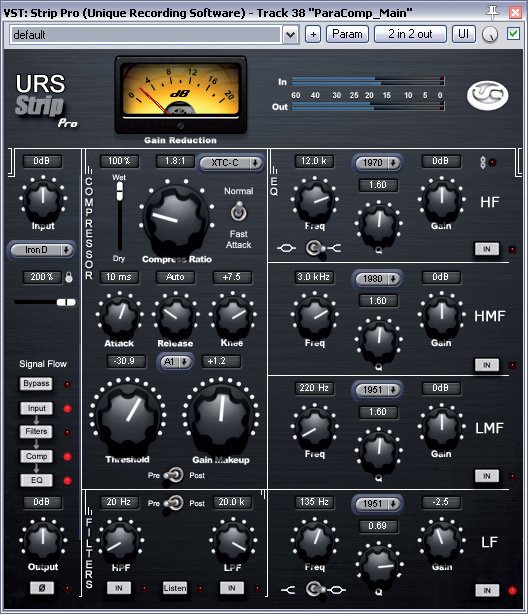 Setting the bass fader was uncomplicated by the resonance problems that stymie so many of the Mix Rescue submissions I receive, but some performance irregularities did undermine its reliability as a mix foundation. Compression from the Thrill Seeker LA plug-in only took me some way towards a remedy, though, because I deliberately processed mildly (2-4dB gain reduction with attack and release times of roughly 25ms and 80ms respectively) to avoid crushing the vital rhythmic note onsets. Still, it was good enough to be going on with, because I was confident that fine automation would take up the slack later on, and all that remained before bringing in the drums was a relatively narrow-band 3dB cut to tame a slight honk at 535Hz. 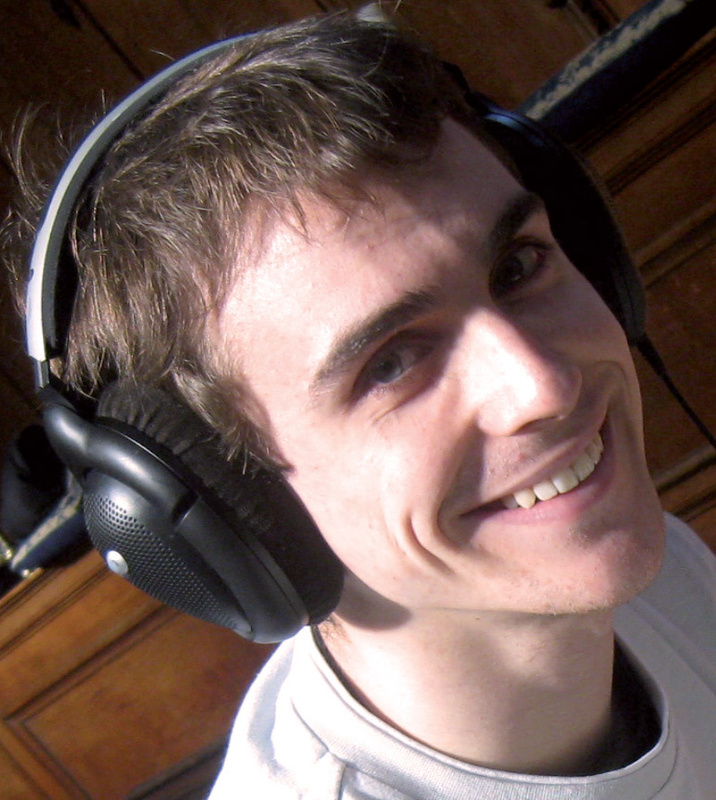 A few decibels of compression from Variety Of Sound's freeware Thrillseeker LA compressor helped Mike to draw more attention to some of the piano part's nice inner details. Given the traditionally background role of the drum kit in this kind of music, the spill from all the other mics had already supplied a good deal of what I needed on its own! The main things to add were some proper low end, better snare definition, and slightly thicker drum and cymbal sustains as a whole. Examining the drum channels in solo, I found the overheads to be clear and clean, with a good mix of all the kit elements, so I felt no impulse to process them just for the sake of it. Phase and polarity adjustments from Variety Of Sound's well-specified PreFIX plug-in helped me to make the most of the kick channel's low frequencies when combined with the overheads, while another PreFIX instance enhanced the attack punch of the snare when its turn came to be added in. Panning the overheads to the extremes gave me the option to spread the instrument right across the panorama, but because Hugh had ensured decent mono compatibility too, I had the freedom to narrow the image without serious tonal penalties. In the event, I plumped for a 40 percent left/right configuration, lending a nice sense of width without wrapping the kit right round the horns! The bass amp used on the session hadn't provided a tremendous amount of low end, so Mike enhanced this using Voxengo's specialist LF Max Punch processor.A few moments of trying to slot the drum mics behind the full ensemble demonstrated that the detail and precision of the overheads capture was pulling the kit too far out front, so I took a few steps to soften that. Using ReaEQ to gently incline the spectrum above 1kHz (reaching 5dB down by 20kHz) helped to distance the instrument a good deal, but the stick transients (faithfully preserved by Hugh's small-diaphragm Neumann KM184s) still came across more sharply than desired. 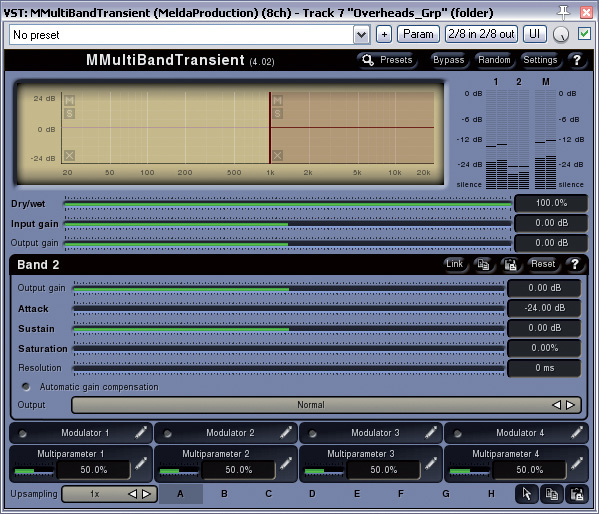 To tackle those, I set up a chain of transient-reducing plug-ins comprising two instances of Melda's MMultibandTransient (a single instance somehow never seems to go far enough for me), followed by Reaper's more stringent Jesusonic Transient Controller. That might seem like a lot of processing, but the effect on the main body of the sound was pretty minimal and it did help tremendously to shove the drums back where they belonged. The kick slotted into the mix pretty well immediately, with a 3dB boost at around 60Hz just adding a little more gravitas, but the snare took a little extra work. I notched a slightly overbearing pitched resonance at 535Hz, but the tone also felt fractionally too heavy in context until I'd made another tight 3dB peaking cut at 260Hz on the overhead channels. Despite these changes, though, I couldn't settle on a suitable fader level until I'd contained some of the more enthusiastic hits with compression. 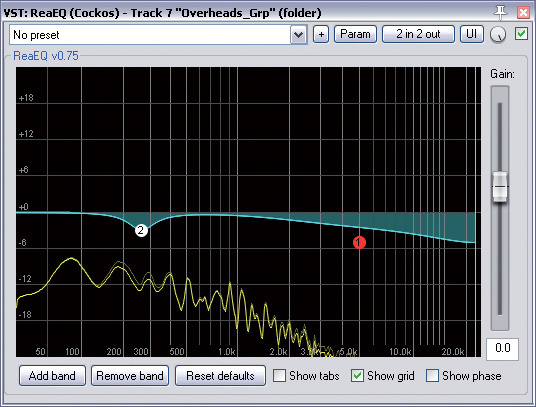 Using a 5:1 ratio, I set a high threshold to catch only louder peaks, and then dialled in a fast 0.8ms attack time, with 4ms of lookahead (a function I love in Reaper's ReaComp) to ensure that the level spikes were caught without significantly adjusting the drum's essential attack envelope, Finally, 188ms of release delayed the gain-reduction reset until the main body of each hit was well past. The result: an apparently more consistent performance without any drastic change in the sound of each drum hit — and subsequently less of an urge to fidget with the fader! The clarity of the drum overhead capture was pulling the kit too far forward in the mix, so high-frequency EQ cut from ReaEQ and dedicated transient processing from Melda's MMultiBandTransient were both called into play to increase the subjective sense of distance. With all the live-take mics in play, the time had finally come to consider the overdubbed lead vocal's placement in relation to them. 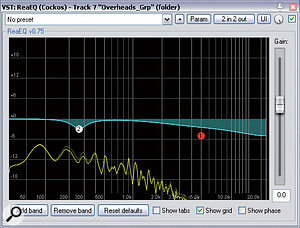 Some 150Hz ReaEQ high-pass filtering and a fairly light 3-4dB compression setting from Universal Audio's smooth-sounding LA2A emulation were hardly controversial decisions, but, after a certain amount of fader footling, I came to the conclusion that the brightness of the close-miked signal was separating the singer too much from the band, and returned to ReaEQ to shelve off 3.5dB above 4kHz. A further octave-wide peaking cut at 325Hz dispelled a lingering low mid-range shadow from the microphone's proximity effect. I had now reached a satisfactory static balance. That's not to say that everything was at its final mix level, but rather that I felt I'd taken set-and-forget mix processing options as far as I could without incurring unacceptable side-effects. Any further progress in correcting momentary imbalances between instruments or highlighting interesting melodic licks was therefore left for later manual mix automation. Thus far, I'd deliberately steered clear of applying any send effects, such as reverb, in order to concentrate on getting a reasonable static balance out of the multitrack. You'll find that restricting yourself to building a mix initially without using such effects is more difficult, but that's exactly why I like doing it — it forces me to work harder at getting the fundamentals of the mix into shape. There's only so much you can do in terms of finalising the mix levels before you introduce the effects, though, so I decided to do this as my next step, before I ventured into any detailed fader automation. Here you can see the Cockos ReaComp setting Mike used to control the snare levels without significantly altering the nature of the drum's sound. 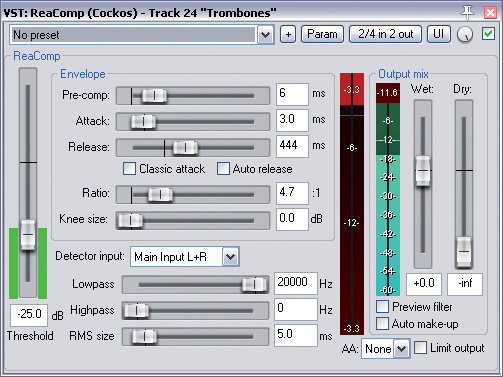 Note, in particular, the Pre-comp parameter, which controls the plug-in's lookahead feature.For a production like this, the main tasks are blending the different microphone signals together to make a coherent ensemble sound, and creating an appealing sense of acoustic space around that ensemble. In both cases, it's reverb that really fits the bill, and specifically reverb that's applied to several mic channels at once, rather than just to individual tracks. 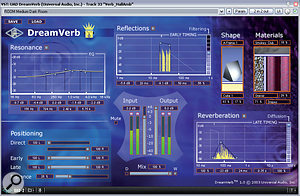 The first patch I set up was in Universal Audio's DreamVerb, its main purpose being to gel the close-mic signals with the recorded room sound, so that they didn't sit too far forward in the mix. This was especially important given my plans to adjust their levels with automation, because I didn't want individual instruments shuffling back and forth obtrusively in the depth dimension as a result of my fader rides. To this end, I kept the patch tight-sounding by shortening and reducing the reverb tail component, and added only enough pre-delay to keep the initial reflections from comb-filtering unduly with the dry sound. However, rather than trying to match the original room sound closely, I took the opportunity to supplement it with more energy in the upper midrange frequencies, and high-pass filtered the effect return as well, to keep the low end clear. As with the drums, high-frequency cut and transient softening were used to sit the lead vocal further back into the ensemble, although in this case it was Variety Of Sound's subtle Ferric analogue tape emulation that provided the latter service. Although all the channels were sent to this effect to a degree, the instruments with the highest send levels were those with least natural spill of their own. So, for example, the saxophones needed more than the rest of the horns because they were driest in the room signal and hadn't leaked into the neighbouring trumpet and trombone mics as much as those instruments had leaked into theirs. Similarly, the piano and guitar mics required more artificial treatment to match the bass's degree of ambience, simply because the bass had spilled over practically everything. The question of where each instrument should be on the mix's front-back axis was also critical, so the rhythm-section mics were, in general, wetter than the brass and vocals. Dropping the reverb in and out of the mix was useful when setting up these sends, as it quickly demonstrated how much the effect was pushing each instrument away from the listener, so it's a good idea to keep a finger on the effect return's mute button during this procedure. In addition, once the levels are mostly set up, it's also worth soloing just the reverb return to check that its frequency balance and subjective acoustic signature both support your vision for the mix. 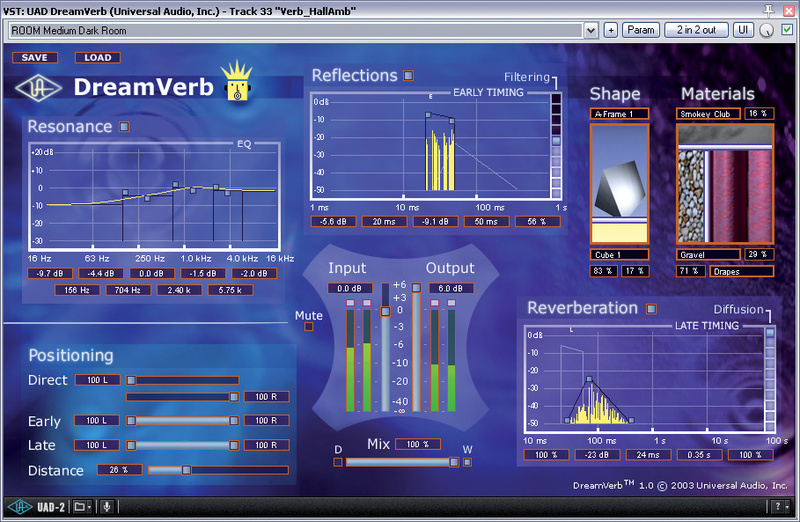 Certainly, I continued making small adjustments to the nature of DreamVerb's virtual room throughout the process of setting up the send levels, as well as tweaking the return's EQ controls to fit it within the tone of the mix as a whole. 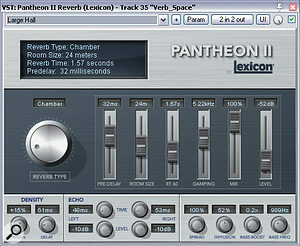 The two main reverb send effects in this mix were a short ambience from Lexicon's Pantheon II plug-in, primarily for 'gluing' the close mics together into a more convincing ensemble, and a longer hall reverb from Universal Audio's DreamVerb, which expanded the acoustic environment into a larger and more flattering space. While any reverb creates an implied acoustic environment, the shortness of this first global effect primarily created an impression of the immediate reflecting surfaces around the ensemble, rather than a sense of the true size of the room. 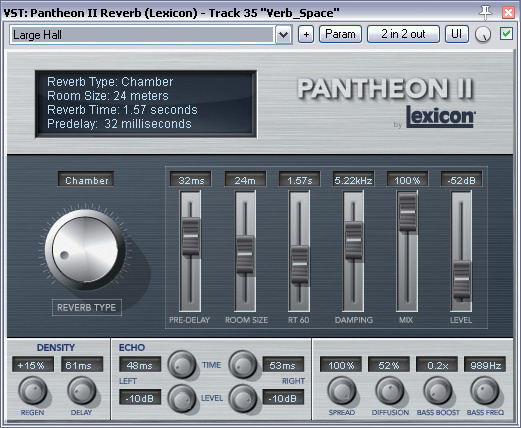 The latter was provided by my second reverb, running in Lexicon's Pantheon II reverb plug-in. 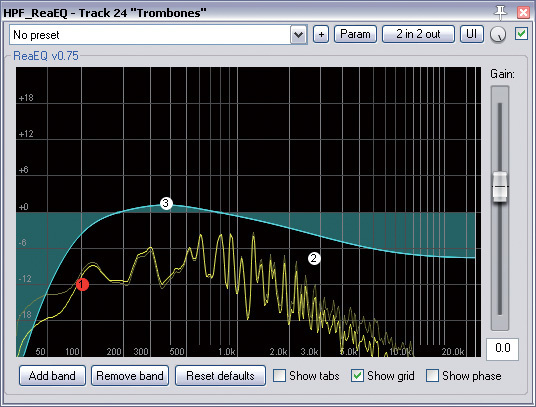 This was one of those rare occasions where the first preset I tried was just what I was looking for: a large and fairly lively chamber with the kind of HF sizzle that you can rarely get away with in modern productions but which really flatters big-band brass. 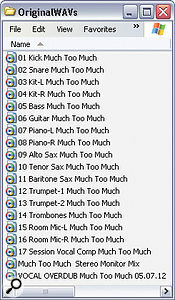 A feed to this from the main brass group channel immediately gave the ensemble more stature, and I also allowed the vocals, guitar and piano to excite this patch, to transport them into the same space. I didn't bother adding separate sends for the drums and bass because they already seemed to be feeding enough signal into the effect, via their spill into the brass and piano mics. While a sense of acoustic realism is important for acoustic music styles, it's not the be-all and end-all, and it wasn't even during big-band's heyday. So, once the ensemble seemed to be gelling effectively, I employed a couple of additional tricks to make the overall mix just a little larger than life. 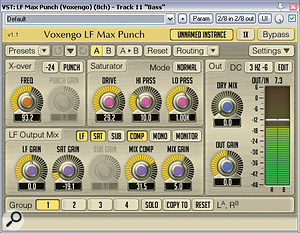 The first of these was some parallel compression across the mix as a whole, using a medium-slow 1.8:1 emulation of Cranesong's XTC hardware unit from URS's Console Strip Pro plug-in, which pulled up the low-level details and effects slightly in the shorter term, while also providing some overall volume riding across the arrangement's different sections. 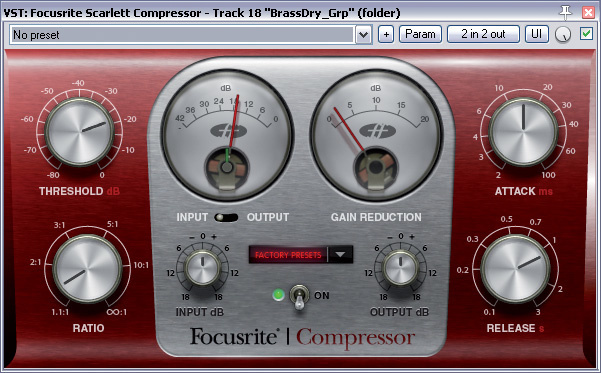 A further parallel compressor channel from Variety Of Sound's Density MkII pushed this concept a little further for the drum group, where I still felt that the drum and cymbal tails were getting a bit lost against the brass. The second sweetener was another reverb patch. This was a less natural-sounding chamber algorithm from Universal Audio's Lexicon 224 emulation that allowed me to add a little sustain to the guitar, piano, and horn section's lower mid-range without significantly contradicting the room characteristics I'd already suggested with the two main reverbs. So far, I've talked only about all the static aspects of this mix but, important as these were to the final sound, they only accounted for maybe half of the time I spent on it. The remainder of my time was occupied with writing automation, making it possible for me to solidify the balance properly without incurring too many undesirable signal-processing artifacts. Firstly, I went through the bass part to make sure that it was anchoring the arrangement dependably in conjunction with the drums, before tackling the brass parts, my objective there being to make the best of the horn section's internal balance from moment to moment. This involved soloing individual mics during different musical segments to find out what each was contributing to the arrangement, and then massaging the levels if I thought anything appeared out of kilter. This is where Hugh's efforts to minimise spill on the close mics really paid off, because it meant I had a lot of scope to influence the recorded balance and musicality of the performance after the fact. Parallel compression was helpful on a couple of occasions in this mix: firstly, on the main drums group channel, where it enhanced the drum and cymbal sustain tails; and, secondly, on the full mix, where it enhanced the low-level detail and provided some fairly transparent automatic volume control between sections. In most cases, I was able to achieve the changes I wanted with simple fader rides, but for some of the horn solos the increase in spot-mic level began to separate the instrument too much from the rest of the ensemble. My solution to this problem was to nudge up the instrument's short-reverb send level as well, restoring a more appropriate distance illusion. At other points in the arrangement where I felt that the whole section's timbre seemed to thin out, I rode up the room mics to warm things back up. The piano was next in the frame, and there were plenty of nice little moments to pull from obscurity here, not least during those sections where horn tacets provided an opening for rhythm details to be heard more clearly. Finally, the vocal had its fair share of fader rides too, as I tried to chart a course between getting the lyrics across clearly and pulling the vocal too far out in front of the band. This turned out to be the biggest challenge with this mix, and none of the effects I'd so far created seemed to connect the vocal overdub strongly enough with the live-session backing parts unless I all but drowned the singer in reverb. As with the overhead mics, this was partly just a function of the clarity of the close-miked sound, because we only usually hear that kind of high-frequency detail when listening to singers close up. However, there was only so far I felt able to pursue EQ cuts in that region without delivering a murky timbre, so I tried other options. 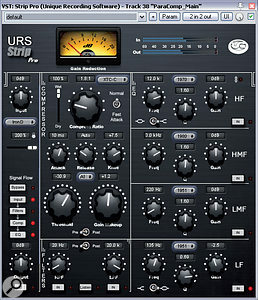 After experiments with different analogue 'smoothing' plug-ins, I discovered that the tape-style compression of Variety Of Sound's Ferric TDS yielded some improvement, but in the end it was a couple of send effects that finally gave me the 'glue' I required: a little 80ms slapback from The Interruptor's freeware Tape Delay plug-in; and a zero pre-delay ambience patch from another instance of Lexicon's Pantheon II. 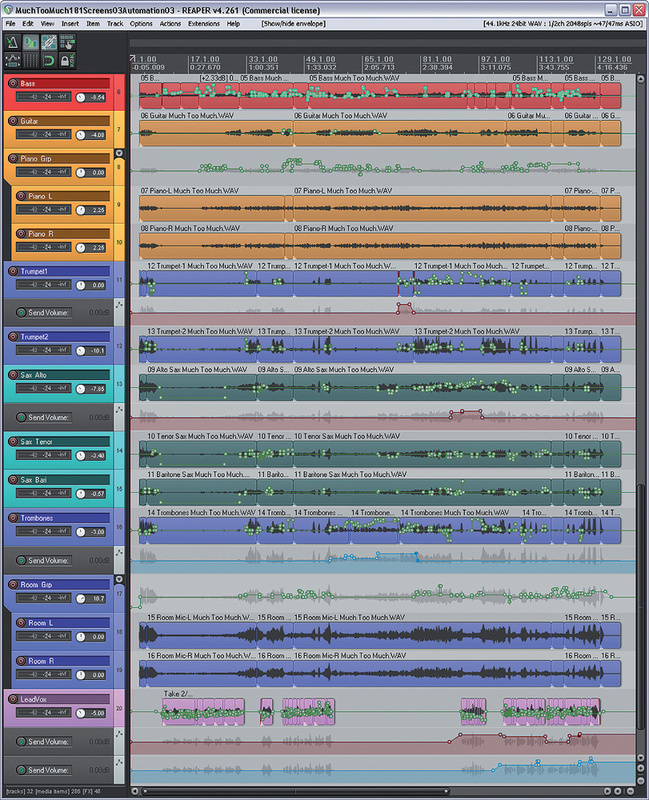 About 50 percent of the work involved with this mix was automation, and you can see the majority of that data in this screenshot. Notice that send levels were also tweaked dynamically in some cases, not just faders. 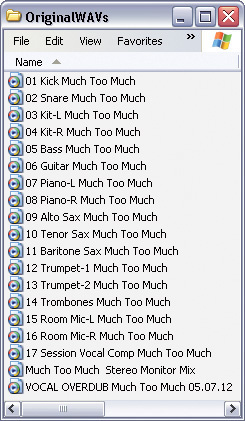 Once I'd put together a preliminary draft of the mix, I bounced it out of my mix session to audition on some other systems, as well as comparing it with a selection of both classic and modern big-band productions. After some deliberation, I decided that a fairly classic sound felt most appropriate here, but with the slightly elevated frequency extremes typical of more modern records. Armed with some notes about my observations, I returned to the mix project and tweaked a few levels (the bass, vocal, and reverb returns in particular), as well as applying some master-bus 'smile' EQ from URS Consol Strip Pro and Variety Of Sound's Baxter EQ to recess the centre of the spectrum and gently boost the top octave. During this process, Hugh, Matt, and Myles also cast their ears over work in progress, offering useful additional feedback, so it wasn't long before we'd homed in on a final version. In an ideal world, mixing would simply be a question of setting up your faders and pans and bouncing down the result. Where real-world recording sessions are concerned, however, that's pretty much a pipe-dream, irrespective of the recording engineer's chops. Even assuming that setup and session time had not been (as it usually is) restricted, there was little Hugh could have done to get any more low end out of the bass amp, for instance. Similarly, it would have been unreasonable to expect world-class ensemble balance from a student group, so although Hugh's choice of close-miking positions led me to add some processing and effects at the mix, the big positive trade-off was that they also enabled me to correct some serious performance imbalances by shuffling the faders. Overdubbing the lead vocal arose out of practical necessity too, and it stands to reason that some mixing work should be required to make that gel with a live recording carried out in a different location. All that said, this multitrack was essentially straightforward to mix from a technical perspective, and would have been a walk in the park had I chosen to leave some performance vagaries in their unvarnished state. In that respect, it provides a rough guide to how much mixing a well-recorded multitrack of this scale typically demands, and also demonstrates that you don't need to pile on mixdown plug-ins if you record with care and forethought in the first place. The master take had already been edited together by the time I got my mitts on the multitracks, but I did do a few little bits of patch-up myself, too. For example, I copied and pasted a full-section brass snippet from 0:1:06 to 0:04 to repair a fluffed brass stab, and performed a few similar fixes on the bass and piano tracks. Although these caused momentary conflicts between the copied section and spill on other tracks, they were pretty negligible, so I figured the cure was better than the disease. The biggest edit I did was to replace the whole section at 3:51-3:58 with a copy of 1:34-1:41. This was because, for reasons I wasn't entirely able to diagnose, the band's playing seemed somehow to go a bit limp at that point in the original version. Although processing might have provided some remedy, it seemed a lot simpler to go for the edit instead. Myles Eastwood: "On hearing Mike's final mix I could not quite believe this was the same band we had put together for the session! Due to it being exam term, we had pulled in several deps and spent most of the session note-bashing, although things began to swing by the end. The mix sounds big and I particularly like the wall of sound Mike has conjured up in the 'shout' sections. I'm also impressed by the large dynamic range — it's always hard to have the courage not to compress the life out of a mix, and yet this track is testimony to the impact of true crescendos and accents. On the SOS web site you'll find lots of audio files, including my final mixdown, numerous 'before and after' processing demonstrations with detailed captions, the full Cockos Reaper project file of the remix — so you can investigate my settings in more detail — and the raw multitrack recordings, in case you fancy having a go at mixing it yourself!